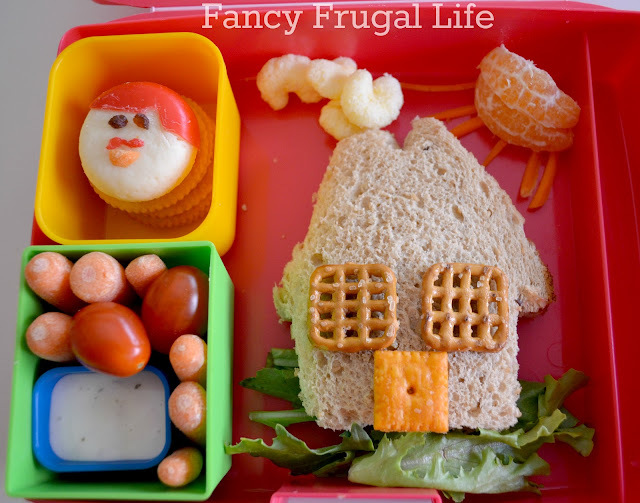 I'm super excited to be giving away a $25 gift certificate to Laptop Lunches for one lucky Fancy Frugal Life reader. Have you jumped on the bento box lunch craze yet? 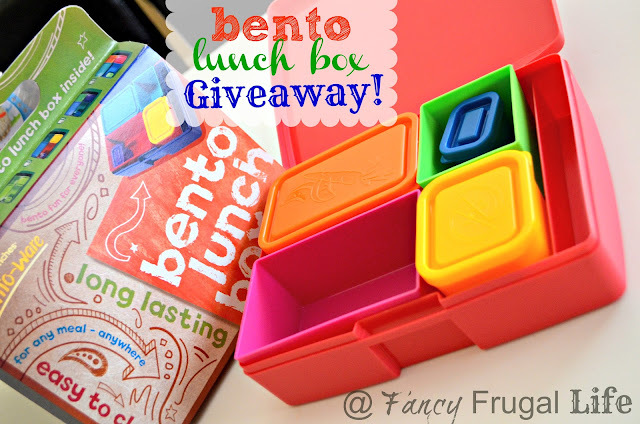 Laptop Lunches sent us a bento box to review and we loved it! I love the compartments and convenient lids. This is such a great way to create a fun healthy lunch by using odds and ends in your fridge/pantry. Here's one example of a lunch I made for my son! But don't think this is limited to kids!! My husband has used it as well. Laptop lunches has a website with a ton of lunch ideas! There are seriously so many variations you can come up with! Kids tend to eat more veggies when they are served in a fun creative way...Don't you agree? Visit Laptop Lunches and tell me how you'd spend the $25. So there is a total of three entries per person. Please leave separate comments! Good luck!! I will pick a winner next Friday Oct. 12 in the A.M. I love the Bento Lunch Box 2.0 in Garden. The colors are so bright and cheery. My daughter would love it - if I don't use it for myself! Ha! Awesome giveaway. I would get the bento lunch bog or bag in Garden for my daughter, She is going to school next year. How cute are these! I've heard of them, but never really 'looked' at them. I'd love to have the Garden lunch box! I also love the jars and those cute napkins - I love the turqoise! Already follow your blog, but 'like' you on FB. I would get a bento box in berry blue for one of my boys. I follow you on your blog, FB and I follow you on Pinterest as well. I also love the site with all those lunch ideas...wow...so many i wouldn't of come up with. If i won the $25 GC it would be so helpful. I have 5 kids...13, 11, 9, 4, 3. My 9 yr old Kevin sees a dietician to help with him eating healthier choices. I would love to get him his own laptop lunch box so he can practice his protion control she is helping him with. I am a stay at home mom and love all the fun ideas i have found that i can do for my 3 older boys. my two younger girls get a kick out of eating a PB&J in the shape of a Heart..lol. I think I would get the Bento Buddies since I recently purchased new lunch boxes for my 3 kids for the new school year. I like how these Bento boxes could be put into a standard lunch box. Or I would save a lunch box kit for next school year. Thanks! Love your blog! I follow you on Facebook! Love all your wonderful, frugal ideas! I follow Laptop Lunches on Facebook! Hi! I just bookmarked Laptop lunches the other day. We are saving our pennies to get my 3 yo the Bento Kit in Garden. She has Sensory Processing Disorder and has a hard time with eating. The mechanics of using utensils as well as processing the different textures of food require so much effort that she gets fatigued and gives up. I noticed that if I make the meal "fun" she lasts almost twice as long. My friend suggested bentos from Laptop Lunches and once I saw all the great colors and fun ideas for making the food exciting, I've been dying to get one for her ever since! I would get the black and pink bento lunch box!